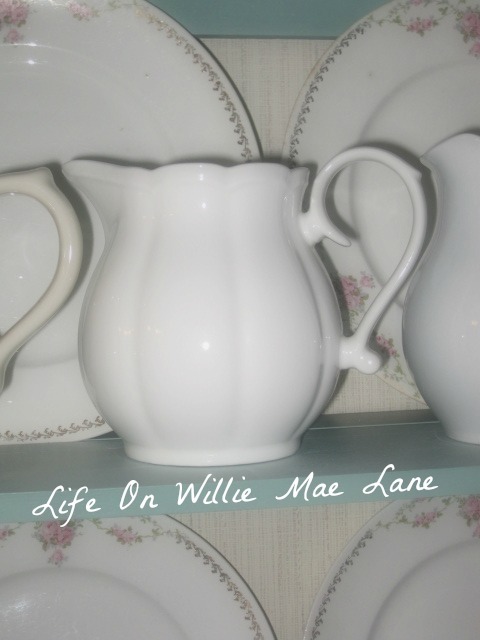 Life On Willie Mae Lane: Jade & White and I Was Featured! Hello and happy Wednesday to you! I am happy to report that I was actually able to sneak a spray paint project in today between rain showers! 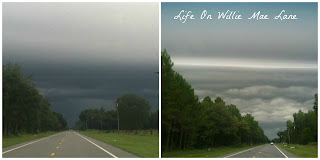 I'll share that in just a bit, but first, I wanted to show you a couple photos I took on the way to my son's college this morning. This is just not the kind of weather you want to be out and about in! Needless to say it poured on us most of the way! 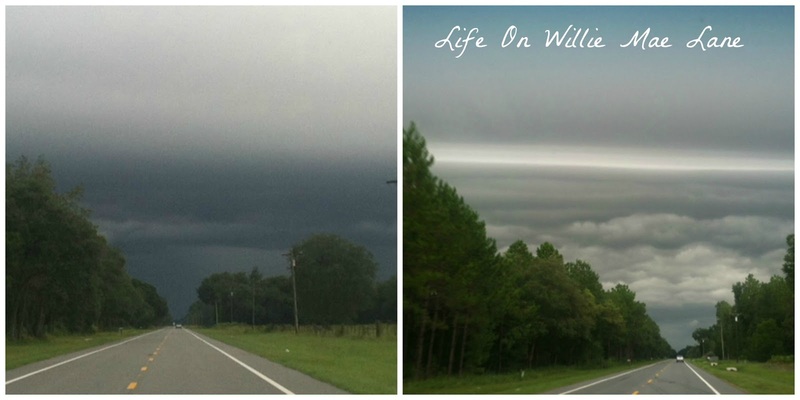 I couldn't help but notice how beautiful the clouds were though, especially in the second photo. These were taken just a couple minutes apart. The closer we got to the bad weather, the prettier the clouds got. Then we got to Branford and crossed over the Suwannee River as we always do. The river is so high right now. I snapped a quick picture when we went over. Look along the banks to see how high it is.....up in the trees! Unfortunately, there will be no boating until it goes back down...:( This is the second summer in a row the river has been too high to boat on! The reason you shouldn't boat when it is so high is because of all the debris.....trees, huge limbs, and trash washing down the river. It's very dangerous. I also want to share some exciting news! 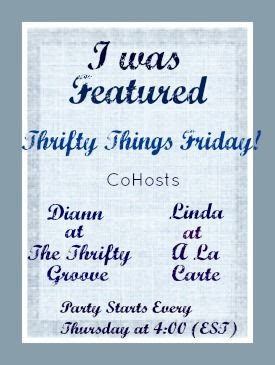 Linda chose my solar light project as one of her features from last week's party! I was honored to be chosen out of all the great link-ups. Linda is such a kind-hearted and beautiful lady...:) I always enjoy reading her blog and communicating with her through comments and e-mails. If you don't know Linda, you should go pay her a visit. She and Dianne co-host Thrifty Things Friday each week....such fun! 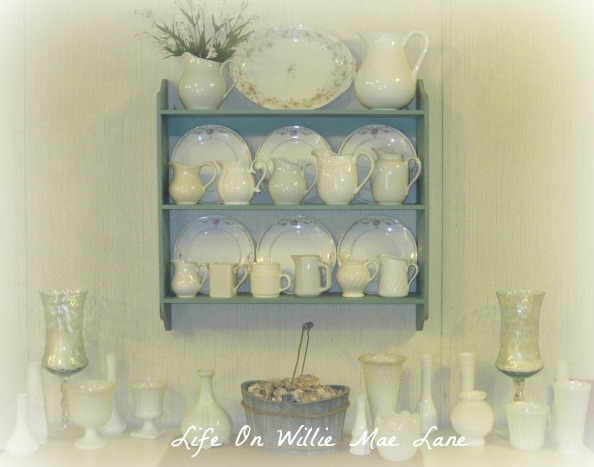 OK...so I mentioned in this post, that I bought something at one of my favorite flea market booths that was going to be getting a little makeover before I shared it. Well, the sun peeked out long enough today for me to dash out the door when we returned home from the college and do a little spray painting! 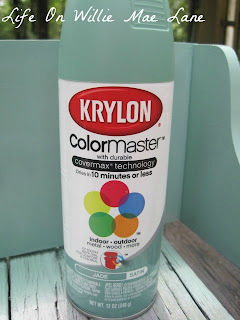 While we were in town, I picked up a couple cans of Krylon spray paint in a new to me color....Jade. 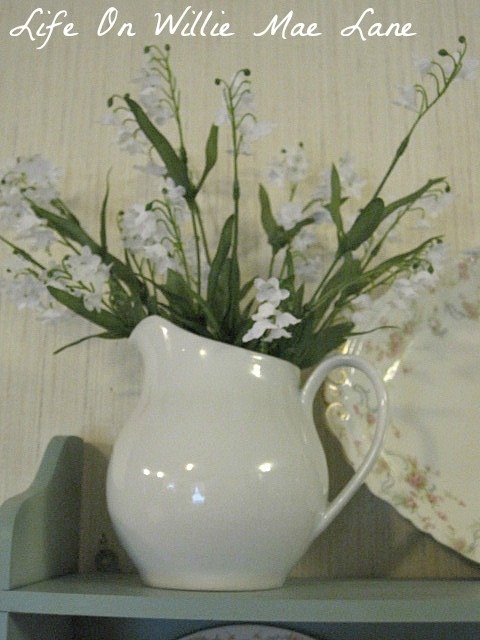 It is the color of the jadeite dishes I love so much. One day I hope to own a few real pieces of jadeite, but until then, I will settle for my knock-offs.....and this little project! I tend to forget to take before pix and after I started, I remembered I hadn't taken one, so I made a mad dash into the house to grab my trusty little camera. 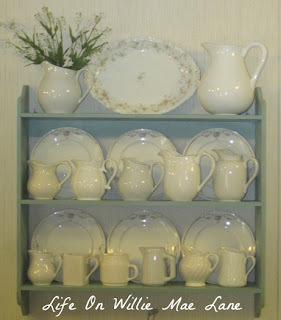 Here is what I bought....a sweet little plate shelf. It was $10 and in perfect condition, so I thought it was worth it. 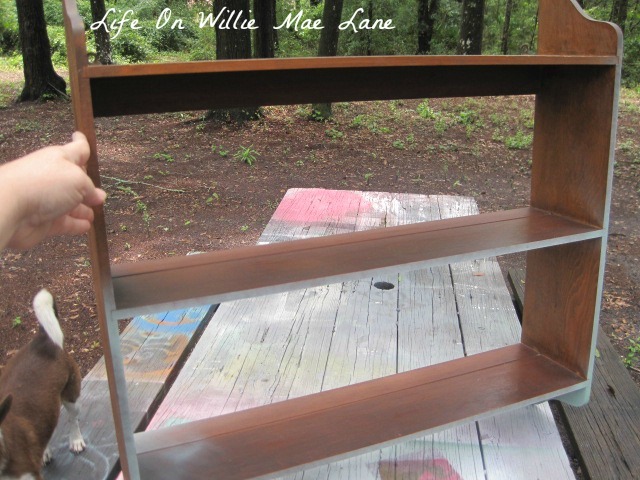 Don't be jealous of my spray painted picnic table....it has a rainbow of colors on it....along with a little brown and white dog! That's my Sassy...sorry I didn't realize she was in the picture and cut her head off! I gave the shelf 2-3 coats of paint, left her out to dry for a few and then brought her inside. Now....I also forgot to take an after picture until I had it on the wall and loaded down. So....no after photo of her empty.....sorry! Here she is hanging over my buffet. I took the mirror down and will hang it somewhere else. I really love the way this turned out. 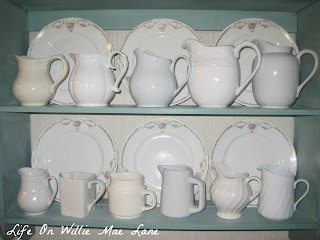 I had run out of room for my little white pitchers on top of my china cabinet and had been wanting a different way to display them. I think this is perfect! How about you? I'm sure I will switch out the plates occasionally, but I'm loving this look for now! 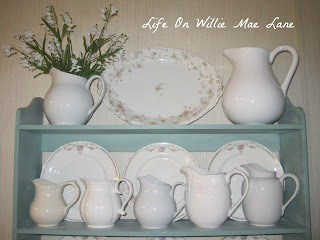 Everything on the shelf was thrifted except for two of the little pitchers and the silk flowers. This one was bought at Michael's. It was half price and I just loved the leaf and vine design. And this one was bought at TJ Maxx a couple years ago. I bought the matching sugar bowl but this was before I started collecting little white pitchers...:) I love her curvy little handle! I robbed the white flowers out of my 4th of July bouquet I recently packed away. 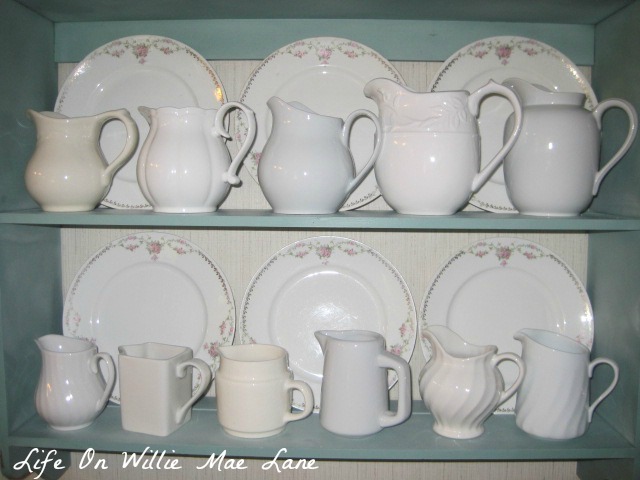 The top and middle shelf. The middle and bottom shelf. 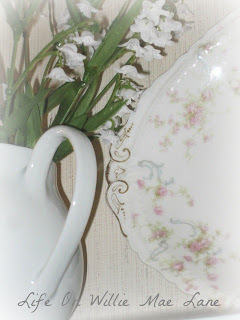 Love this platter I found at the flea several months ago. It has a chip in the side but you can't even tell since it's resting in the plate groove. One just like it was going for close to $100 on ebay and I gave just a couple bucks for it! Well, that's it for today folks! I am steadily crossing things off my mile long to do list and I'm feeling pretty jazzed about that! 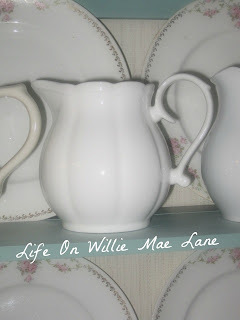 I'm off to work on another cute little project for my classroom. Oh...if you didn't see my little lady in red and aqua from yesterday, click here to see her. She is just too cute! Love, love, love...the shelf and how you have it decorated. 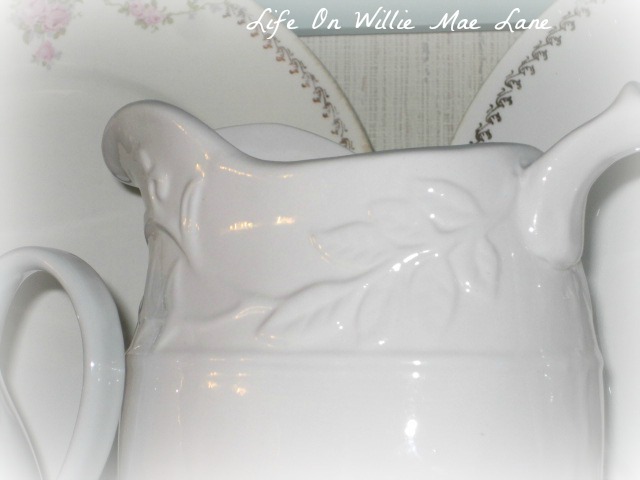 Your dishes look gorgeous on it! The shelf and its new color shows off your white pitchers beautifully. I love that color. Will your son live on campus? Such a fun project, and beautiful color choice. 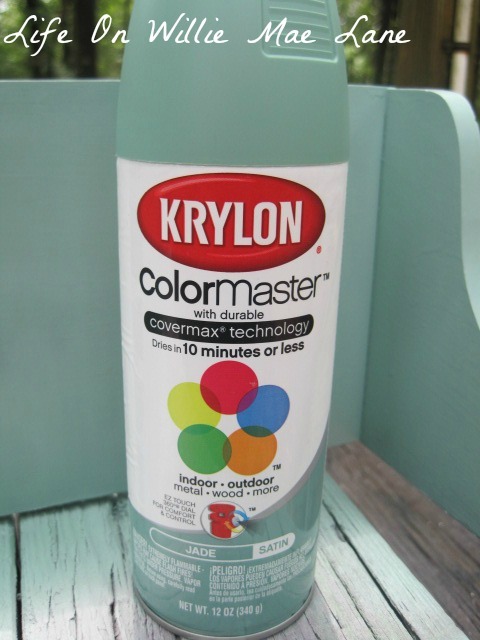 I never thought of using spray paint, cool. Something new to try and it was such a fast project with big results. Yay, I love learning new things. Have a lovely day, friend. That plate shelf is really nice. I love that colour you chose, it's perfect with your white pitchers. It is absolutely beautiful. The way you decorated it finished it to perfection. I think I actually have a little shelf like it. I am looking for a bigger piece of furniture, but maybe I could paint it to create a little hutch. Hi Vicky! I am visiting from Roxi's blog. I am not much a DIY person myself, but I do like seeing what other people are doing. What you did with that shelf is AMAZING! It looks like a different piece all together! And the china pieces really set off the blue color. Happy to 'join' you on your journey!